Farming Foible, or an Agrarian Adventure? : And the lion shall lay down with the lamb. 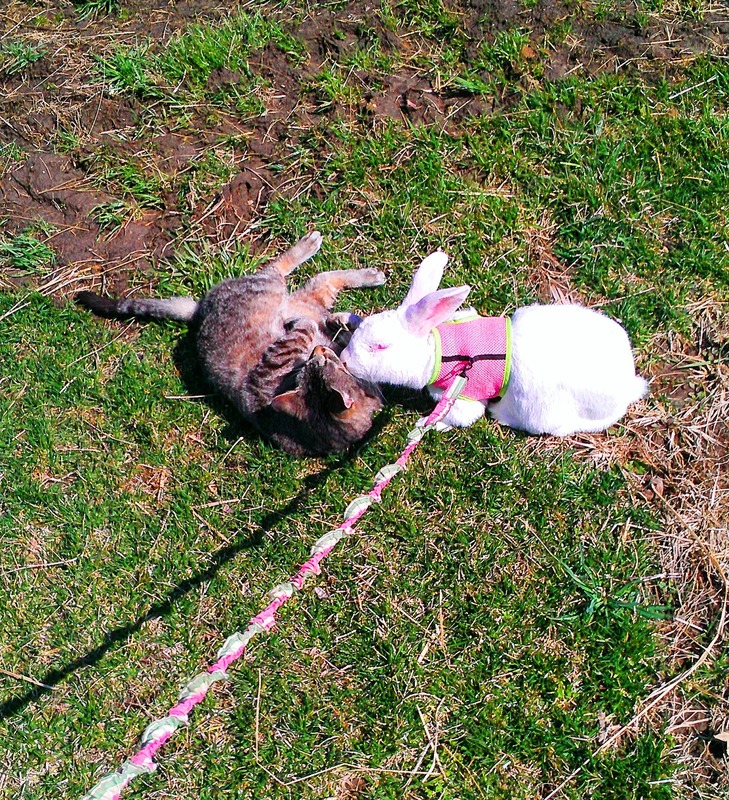 Or the murderous cat shall lay down with the bunny. Same thing. I think I am in the twilight zone. I have seen this cat jump straight up in the air four feet in order to nab a bird as it flew by. She is also HELL on baby bunnies, squirrels, chipmunks, and probably calves too. Who knows? I honestly don't know how many times she has killed, but I do know that she is one heck of a hunter. And that her claws belong on a freaking velociraptor. Seriously, she must sharpen them on razor wire or something. It is instant blood when she decides to purr and knead your leg. I am not sure what her end game is with Mr. Whiskers, but I wouldn't trust her if I were him. Maybe her grooming is just tenderizing him? Lulling him into a false sense of security? Some weird sadistic prank where she befriends the friend of her victims? Or maybe it is repentance for all the bunny lives she has taken? Has she flipped over a new leaf? Is she in kitty counseling?